Short post for today. 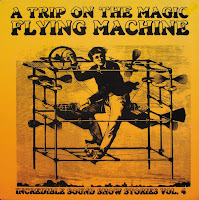 This is one of the best psych volume in the Incredible Soundshow Stories series…so good I am still listening to it years after ripping it. There's just one heavy prog/psych in the track listing, all the rest is absolute classics. The word "Psychedelic" is mentioned so many times on this comp that I will spare you the track listing! There's also too many favourites in there to start commenting them… you'd end up with another monster post. Just climb aboard the magic flying machine here. We enjoy your comments… get typing!. man, i love fuzzy wasabi! thanks alot! Another nice blog on the interwebs, thank you! i thought i found it but it isn´t the same song. is it you or the youtube dude?